Do you have ancestry in Bendigo? The Annals of Bendigo v1 1851-1867 (Mackay, George 1912) collection was gleaned mainly from 'The Bendigo Advertiser' which started in 1853. This is a compilation of events that happened throughout the period, all in chronological order, giving the reader a quick overview of the highlights of each year. Meetings, new railway, the hospital, ministry news, dense fog, Burke & Wills, severe floods, gas lines, theatres, building works, hotels destroyed by fire, births and deaths of locals, the new newspaper, election bungle, Bendigo Volunteer Rifles, vineyards, local events, and of course mining, including mining statistics - it's all listed here, plus so much more. It includes many photographs of local people and happenings. 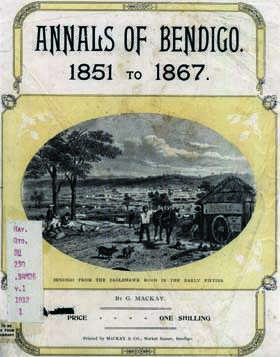 Volume 1 of the 'Annals of Bendigo' was published in 1912, and was compiled by George Mackay. He went on to compile four volumes, taking the series up to 1920. The work has then continued using various compilers. Currently the series stands at eight volumes and has been taken up to 1987. You will find information on thousands of local people and happenings listed throughout this volume. Not only a must for those with ancestors in Bendigo, but also ideal for anyone with an interest in the social history of Bendigo, or Victoria as a whole. In 1916, George Mackay continued his popular series of the 'Annals of Bendigo'. This third volume covers the period 1892-1909, and here you will find that the population of Greater Bendigo is listed as 46,463 thanks to the statistics from the 1901 Bendigo census which have been recorded. Similar in style to the earlier volumes, this is a vast collection of information gleaned primarily from 'The Bendigo Advertiser'. It is a record of events that happened throughout the period, all in chronological order, giving the reader a quick overview of the highlights of each year. Meetings, new railway, the hospital, ministry news - including new ministers, elections, the rain of red mud, sports groups and facilities, mining accidents, portraits unveiled, hospital fair, obituaries, photographic pioneers, music and drama, tramway, fires and floods, openings of new public buildings, the first Old Bendigonians Reunion, St Aidan's Orphanage, local events, and of course mining, including mining statistics - it's all listed here, plus so much more, It includes many photographs of local people and happenings. You will find information on thousands of local people and happenings listed throughout this volume. A treat for anyone with an interest in the social history of Bendigo, or Victoria as a whole, and a must for anyone exploring their family history or building a family tree.